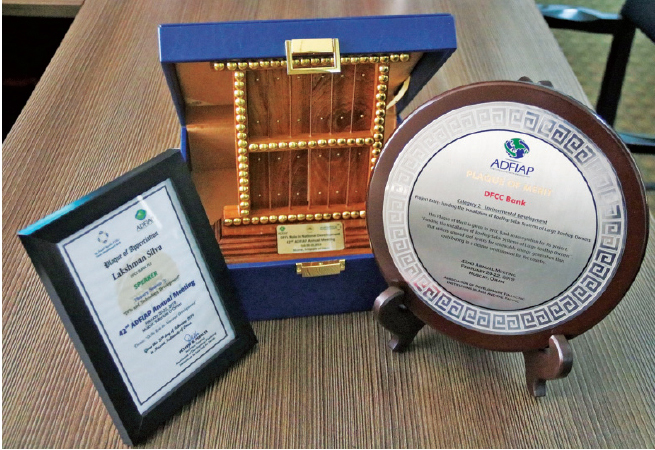 DFCC Bank was bestowed with a Merit Award at the Association of Development Financing Institutions in Asia and the Pacific (ADFIAP) Awards Night held in Oman on 20th February 2019. The award was given under the ‘Outstanding Development Project Awards, Category 2, Environmental Development’ for DFCC Bank’s project, ‘Funding the Installation of Rooftop Solar Systems of Large Rooftop Owners’. By generating 11.4MW of solar power, this project contributes to the overall objective of the ‘Soorya Bala Sangramaya’ of the Government of Sri Lanka of adding 200MW of solar electricity to the national grid by 2020 and 1,000MW by 2025. The award was accepted by the CEO of DFCC Bank, Lakshman Silva from Nahla Al-Hamadi, Director General of Industry, Ministry of Commerce and Industry. An eminent banker, Silva was further invited to speak at the Plenary Session 3 of the 42nd ADFIAP Annual Meeting, on the topic - DFI’s and Technology Development for which he was bestowed with a token of appreciation. The session was attended by ADFIAP members, international partners, local delegates, and distinguished guests from the Omani government and ministries. Commenting on the award, Lakshman Silva said, “DFCC Bank has gone a step ahead from reaffirming its support for renewable energy by playing a proactive role by extending green financing for projects that harness renewable energy to take Sri Lanka closer to increase its renewable energy production while making a contribution to the national electricity grid. Developing green energy requires us to think out of the box and this unique project leverages on rooftops without having to stop due to scarcity of land. In 1996, DFCC Bank financed Sri Lanka’s first-ever privately owned, grid connected mini-hydro power plant, with both long-term debt and equity. The success of this pioneering project catalysed the harnessing of the country’s non-conventional renewable energy resources resulting in a nationally significant industry, which today supplies nearly 10% of the nation’s electricity needs.